"You race through the tangled forest, chased by a mob of vicious Giaks. Somewhere in the distance a pack of Doomwolves howls. Up ahead you can hear the roar of the waterfall, cutting off your path. What do you do next?" You are Kai Lords - brave and noble warrior-monks sworn to protect the realm of Sommerlund from the evil of the Darklords - adventuring across the world of Magnamund. You and your friends will face terrifying enemies and uncover fiendish plots, working together to overcome the wicked plans of the Darklords and emerge victorious! 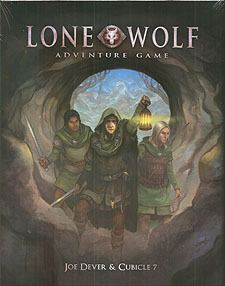 Joe Denver's Lone Wolf gamebooks introduced a generation to fantasy gaming - now the legend continues with The Lone Wolf Adventure Game. Epic quests, thrilling combat and a world of dangerous adventure lie ahead! This boxed set contains everything you need to play right away.